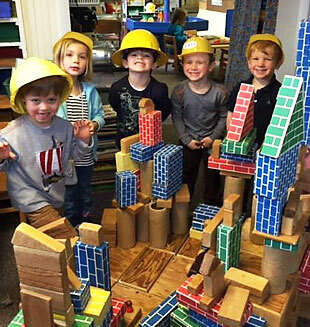 Erdman Preschool offers Enrichment and Extended Day Programs for all ages in addition to our 2, 3 and 4-day classes for Young Threes, Threes, Older Threes, Fours and Fives. Families can choose to take advantage of our extended day programs to provide more flexibility and offer children more play time with friends. Programs are open to all ages and will run only if the minimum attendance is met. Registration for Extended Day and Enrichment Programs opens on April 2nd, 2018. It is first come, first served and is ongoing through the fall as space allows. Gain more flexibility in your day! All ages welcome every day for free play. Register for the year to guarantee your spot, or sign up on the bulletin board in the hallway for the day(s) you want to drop in, as early as 2 weeks in advance. Day-of sign-up is offered by calling the office by 8:15 AM or 3:15 PM (if space is available). Drop-off and pick-up are outside on the playground, weather permitting. Max 10, min 2. Cost: $5 per child, $3 for second child in family (for all or any portion of the 1/2 hour). Begins Monday, September 17th, 2018. Lunch Bunch for 4s and 3s that attended Lunch Bunch last year will begin Monday, Sept. 17th, 2018. 3s begin Monday, Oct. 15th, once they are more familiar and comfortable in their class. Your child must be self-sufficient in the bathroom in order to attend Lunch Bunch. Drop off on the playground (weather permitting), pick up in the classroom. Max 18, min 2. $10 per child. Register for the year to guarantee your spot, or sign up on the bulletin board in the hallway for the day(s) you want to drop in, as early as 2 weeks in advance. Day-of sign-up is offered by calling the office by 8:15 AM or 3:15 PM (if space is available). Max 12, min 4. Cost: $30 per child (includes Lunch Bunch fee). Begins Monday, September 24th, 2018. * This program is an extended playtime. If your 4- or 5-year old would enjoy more hands-on, curriculum-based enrichment activities, check out our Enrichment Programs. Registration for Extended Day and Enrichment Programs opens on April 2nd, 2018. It is first come, first served and is ongoing as space allows. Sign up for these programs is offered in advance for the year, or as-you-go by using the sheets on the Parent Board in the upstairs hallway. Sheets go up 2 weeks in advance for as-you-go. NOTE: When signing up for Stay & Play, please write your child's name on BOTH the Stay & Play AND Lunch Bunch sheets for the desired day. Give your child more of what they love about Erdman! Learn more about Explorers, Imagineers and Bookworms! The emphasis is on fun and learning with friends in a small group.